The full impact of austerity policies across Europe is still being assessed, but it is clear that their gendered impacts have been consistently severe, structural and manifold. They have also been, until now, under-researched and under-estimated. This book brings together the research of leading feminist economists in the area of gender and austerity economics to perform a rigorous gender-impact analysis both at national and pan-European levels. The chapters not only offer thorough evidence for the detrimental gender-impact of austerity policies across Europe, but they also provide readers with concrete suggestions of alternative policies that national governments and the European Union should adopt. 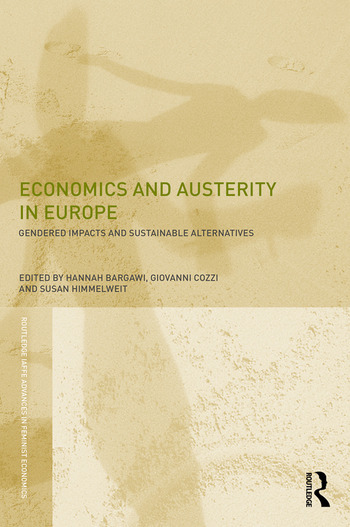 With a combination of country case studies and cross-country empirical analysis, this book reveals the scope and channels through which women and men have been impacted by austerity policies in Europe, and goes on to offer readers the opportunity to assess the feasibility and implications of a feminist alternative to continued austerity. This book will be invaluable to social science students and researchers, as well to as policy-makers searching not just for a Plan B to continued austerity policies but for a Plan F – a feminist economic strategy to stimulate sustainable economic recovery. Austerity and after: the case for a gender approach. Hannah Bargawi, Giovanni Cozzi and Susan Himmelweit. Explaining austerity and its gender impact. Susan Himmelweit. Hannah Bargawi is Lecturer in Economics at the School of Oriental and African Studies (SOAS), University of London, UK. Giovanni Cozzi is Senior Lecturer in Economics at the University of Greenwich, London, and a member of the Greenwich Political Economy Research Centre (GPERC), UK. Susan Himmelweit is Emeritus Professor of Economics at the Open University, UK.